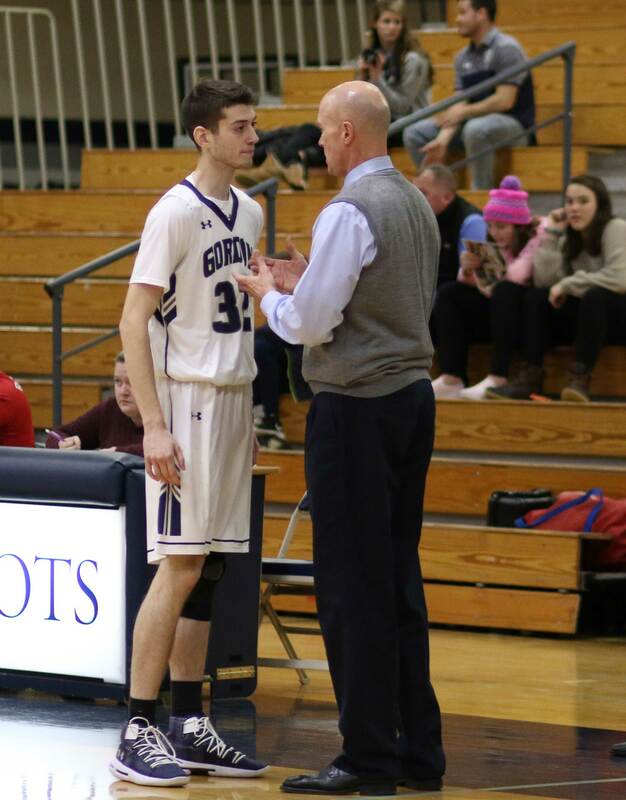 (Wenham MA) You start off missing two shots and having three turnovers. The opponent steals the ball nineteen times in the game. You miss sixteen free throws. Okay, now we’ve got the bad news out of the way! 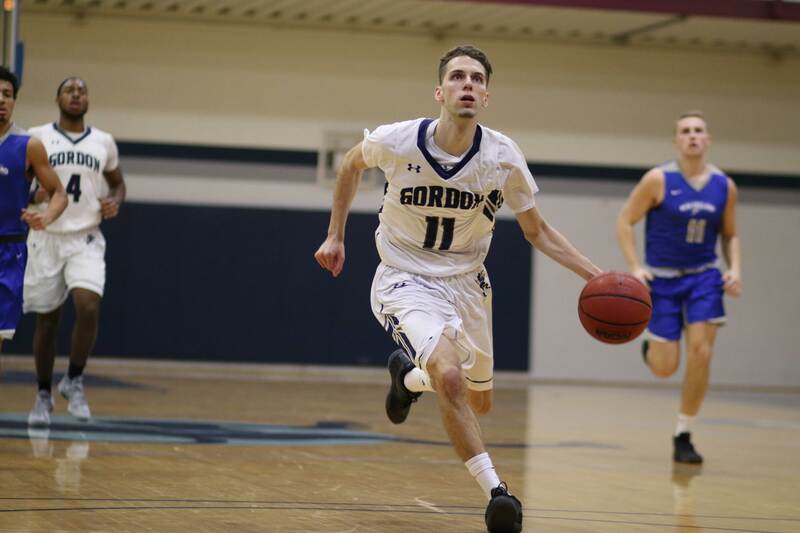 Gordon recovered from the loss to Western New England on Saturday by defeating the University of New England, 100-71, on Tuesday night at the Bennett Center. 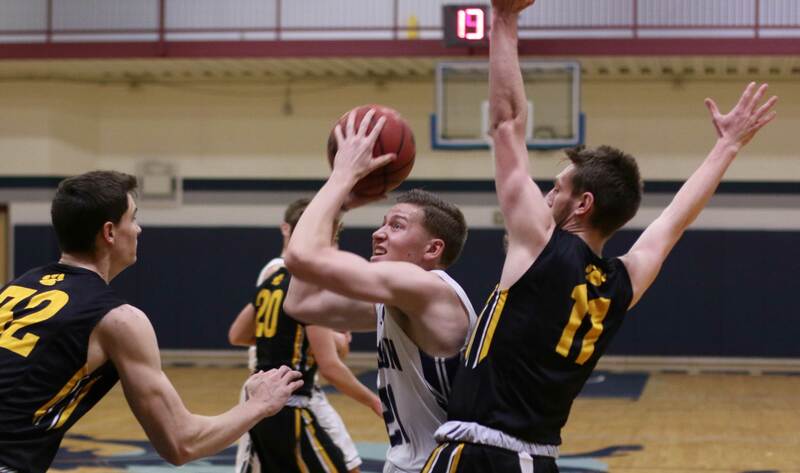 The Scots (17-2) fell to Western New England on Saturday because they started slowly. Tonight’s start looked like more of the same. UNE jumped into an 8-0 lead but it disappeared in a hurry. 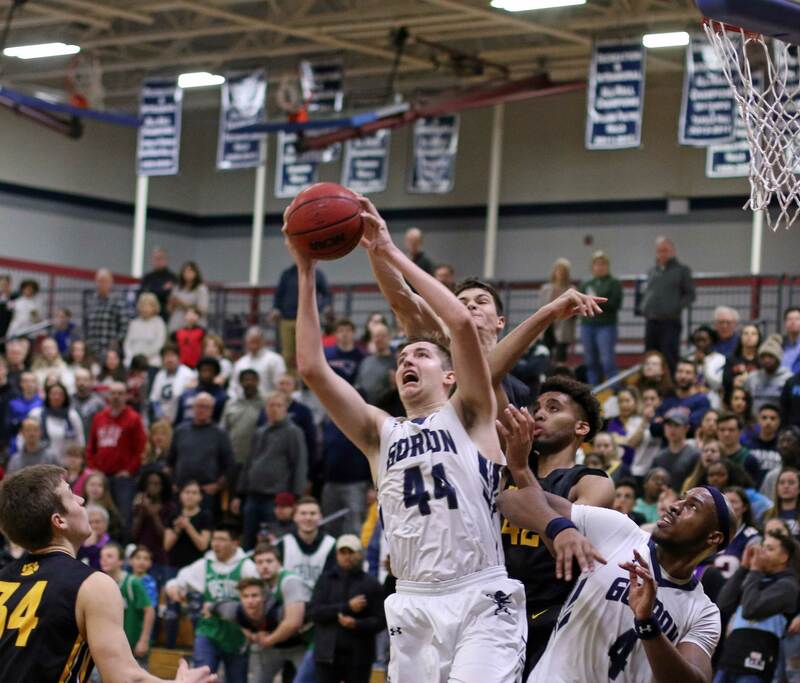 The Scots began to make shots and their defense tightened up. Gordon moved in front 16-13 and then put effective offense/defense together for the next five minutes. 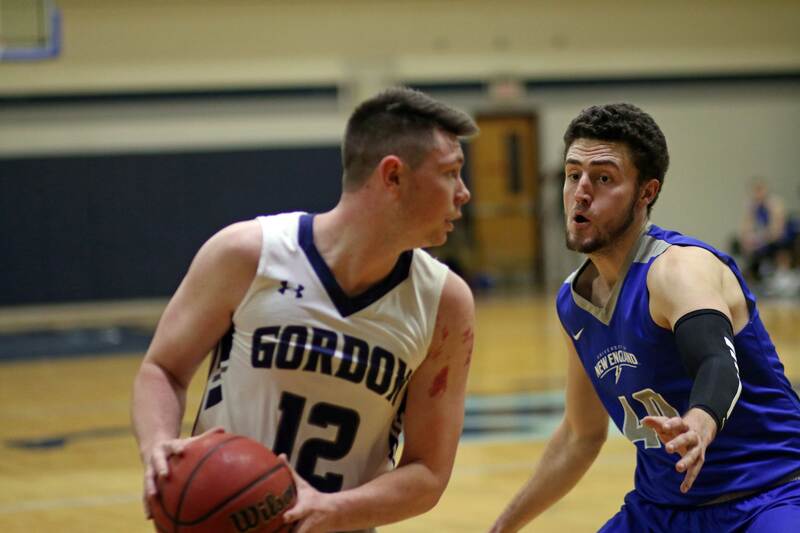 While the Nor’easters missed seven shots and had three turnovers, Gordon rolled off fourteen unanswered points. Eric Demers had a layup, a three, and two free throws in this good segment. Noah Szilagyi added a layup (after a steal) and a three. Josh Ribeiro contributed a layup. That burst put GC in front 30-13. Halftime was 55-28. Earlier in the season there was a big lead against Curry that melted in the second half. Not tonight. The good Gordon defense stayed in place when the reserves had their turns on the court. The visitors from Biddeford (Maine) substituted in quantity, pressed full-court, and fired three’s. The firing three’s part was disrupted by the solid GC perimeter defense. Unusual scoring numbers tonight. We usually find either Eric Demers and/or Garrisson Duvivier leading the scoring. Versus UNE (5-14) it was Parker Omslaer (16), Noah Szilagyi (14) and Avelino Damoura (13). It was a career scoring night for Avelino. The sophomore got to the basket and made several three’s. The less said about his foul shooting, or the team’s foul shooting, for that matter, the better. When Eastern Nazarene dropped out of the Commonwealth Coast Conference the team total changed to nine. No longer is every team playing on the days of CCC inter-league play. Point? Gordon has no game this coming Saturday and won’t play again (Wentworth) until January 29th. Garrisson had his 15th double/double of the season. 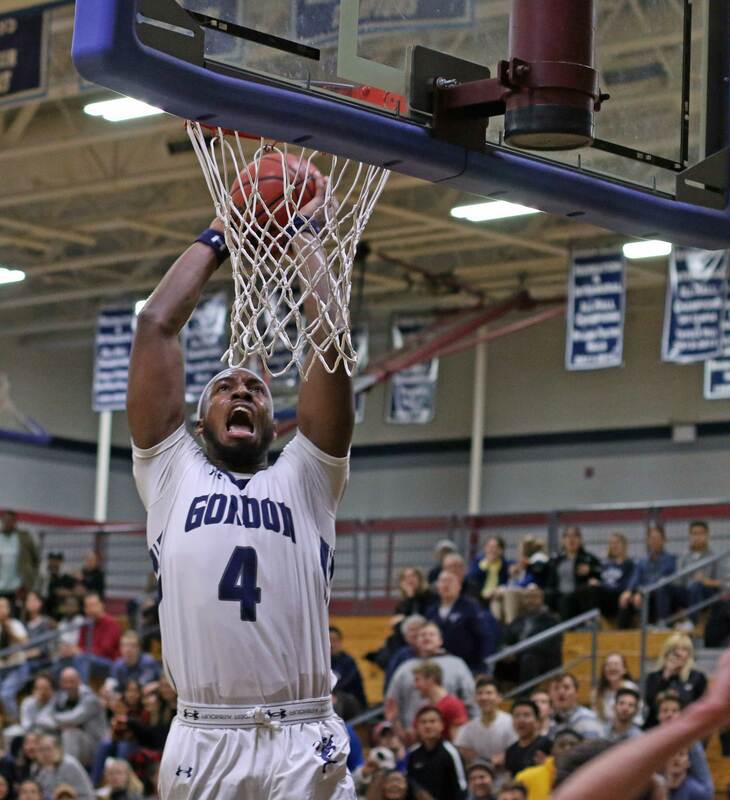 GD, in case you’ve forgotten, is Gordon’s 2nd all-time leading scorer. Eric Demers got into foul trouble and saw short minutes as a result. He had only eight points but his teammate (Josh Ribeiro) assured me that there was no cause for concern: “Eric had a slow night but that’s just one night. 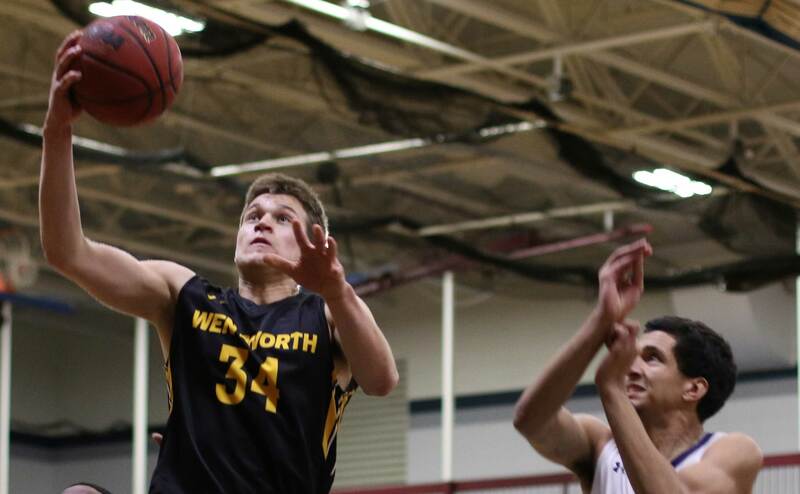 He’s going to come out and score thirty next game.” Consider yourself warned, Wentworth! Our neighbors in Beverly took another loss to Nichols tonight. GC and Nichols have only one conference loss each. The rematch in February (at the Bennett Center) is starting to shape up as a very special game. 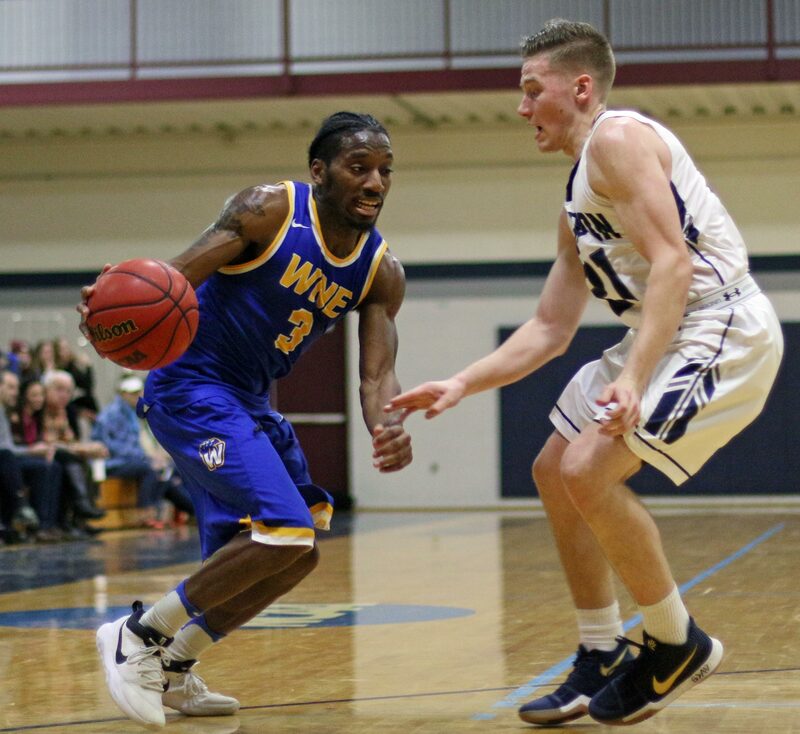 Mikey Pettway – led Western New England with 24 points including 14 in the second half. (Amesbury MA) Wake up, call! Silky Sullivan was a famous race horse. His specialty? Starting slowly and then coming on fast to win at the end. A special camera was often used to show how far back the horse was….before he would rush up late to win. 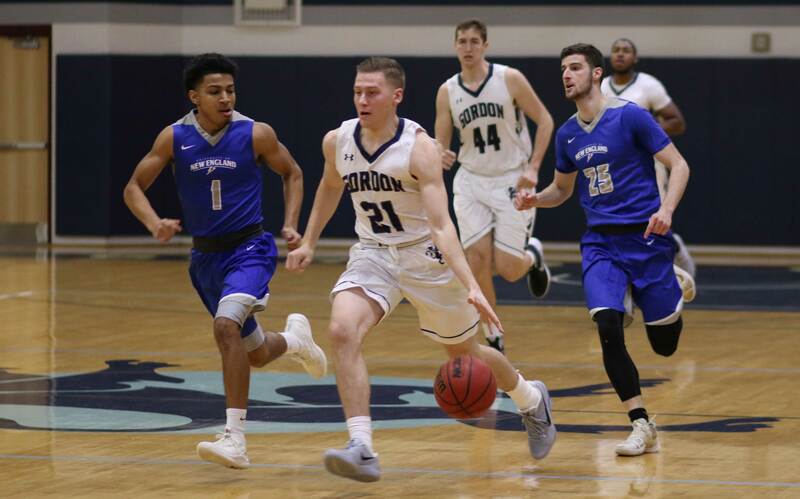 The Gordon College Fighting Scots were no “Silky Sullivan” this afternoon in Springfield against Western New England. They did get the bad start part right but not the rest of it. The result was a 94-88 frustration against the Bears. 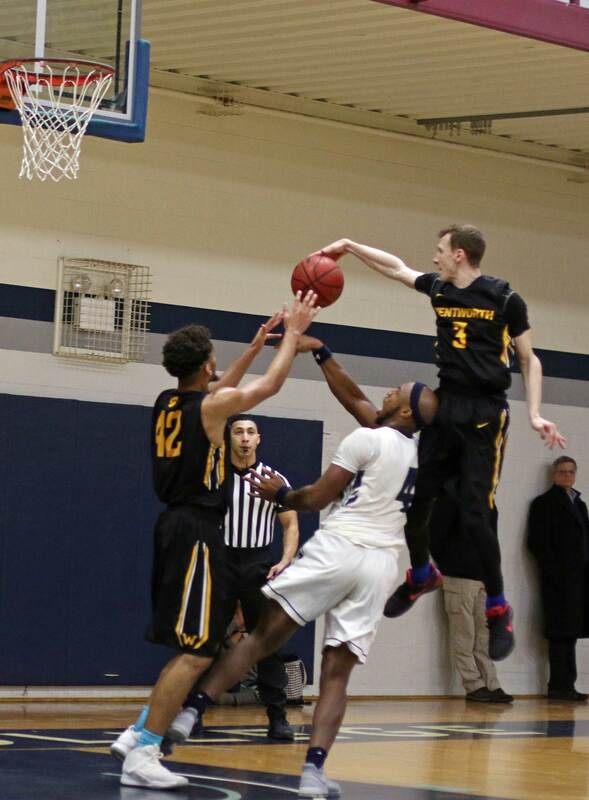 The Scots (16-2) started badly on both ends of the court (trailed 50-33 at the half), but we had seen this before. In the second half, Gordon shifted into comeback mode and turned a 57-36 deficit into a very tight, 66-63, close one in 8 ½ minutes. Shots started falling on one end and not-so-much down the other end. With 10 ½ minutes to go, you “knew” where this was going…….or so you thought. WN came in 5-12. 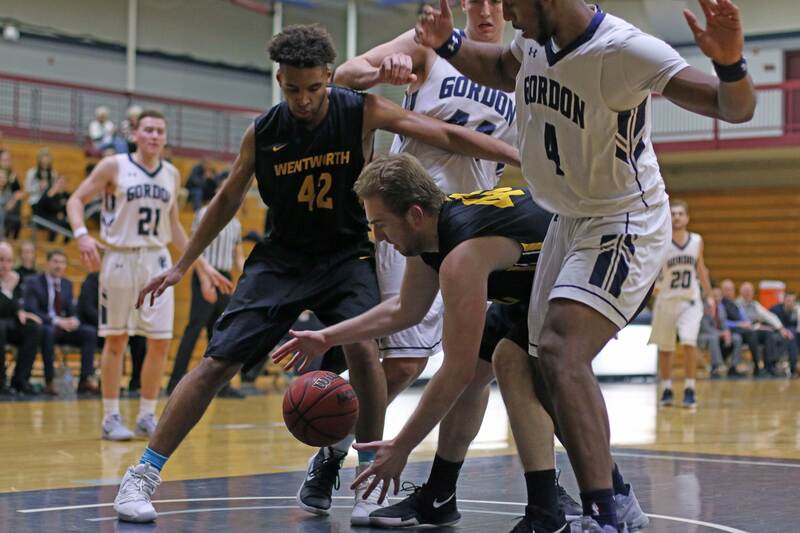 WN had collapsed in the second half at the Bennett Center in December and lost 99-70.
Credit the Bears, they “forgot” what was supposed to happen and in the next two minutes had a triple (Tim Reilly), another triple (Mike McGuire), and a jump shot (Mikey Pettway). The Scots went scoreless. 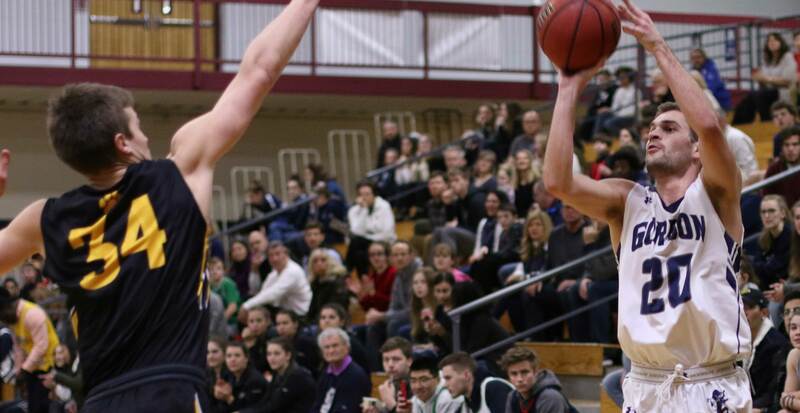 The lead expanded back to eleven (74-63) and the Scots lost playing catchup the rest of the way. 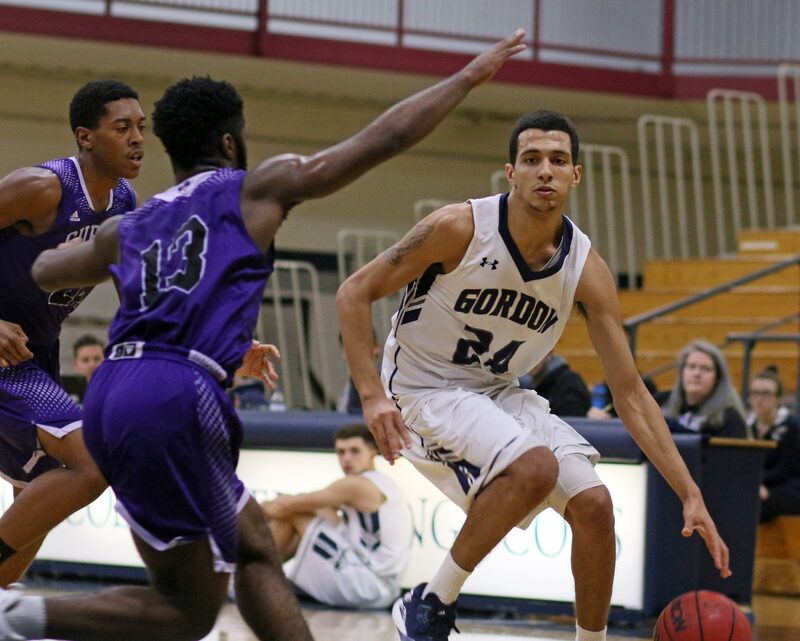 Garrisson Duvivier had a 26-point second half with seven rebounds and two steals. 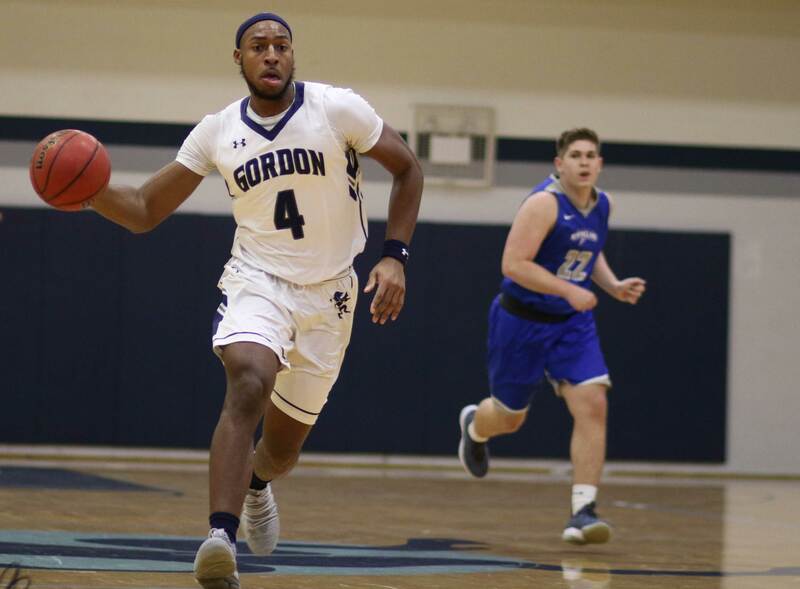 Wasted in the second half was a performance by Garrisson Duvivier that may have been the best half anyone in a Gordon jersey every played. Check these 2nd half numbers: 26 points, 7 rebounds, 2 steals! As great as GD’s performance was, it wasn’t enough. Why? Blame WN senior Mikey Pettway. The Commonwealth Coast Conference All-Star has a 20-point average. First time against the Scots MP had a surprising six points on 3-for-10 shooting. He’s a lot better than that and this afternoon he was, especially in the second half. Mikey ended with twenty-four points, getting fourteen of them in the second half (along with four assists). Mikey’s play was crucial because the Scots had awakened to the possibility of a game being lost and were playing with urgency. The Bears (6-12) shot 50% and were adept at making the mid-range jumpers that the Gordon zone seems vulnerable to. They dared to go to the basket against the GC shot blockers and often got away with it. Gordon struggled mightily from long range connecting a season-low five times on twenty-four attempts. The team averages eight made three’s a game. Get the average and today’s result was a W.
After sixty-four days the Scots (16-2) have their second loss. Not a good start to the second time through the other eight teams in the CCC. Other coaches in the games ahead will be studying the video of today’s game for ways to defeat GC when it is their team’s turn versus the Scots. Good luck to them on that one. The Bears played better against Gordon than anyone else has to date. The efficiency number (subtract bad stats from good stats) confirmed the excellence of Western New England this afternoon. Good shooting (50%), rebounding (42), assists (18), and low turnovers (10) show what it takes. And don’t forget Mikey Pettway getting twenty-four points. Teams will have to play well to defeat Gordon. 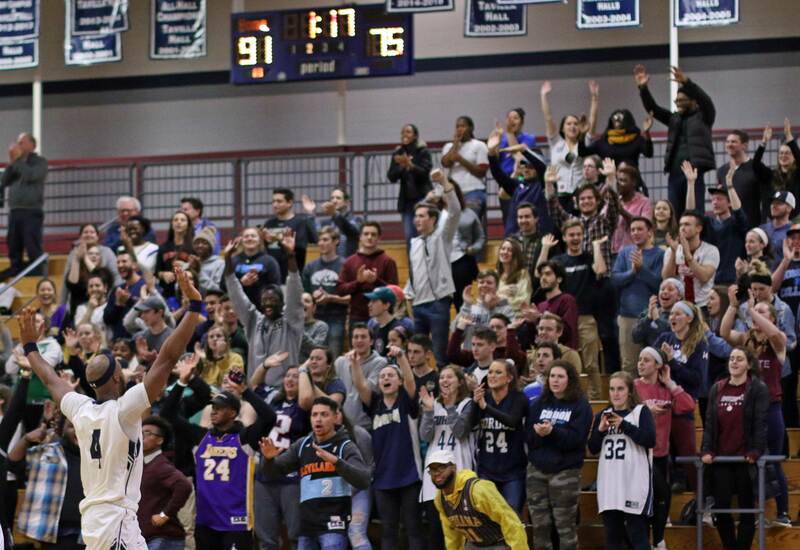 UNE will be at the Bennett Center on Tuesday night and their style (press, shoot 3’s, and wholesale changes) is entertaining to watch. Maybe not so much for Kendall at the scorer’s table trying to keep track of stats! 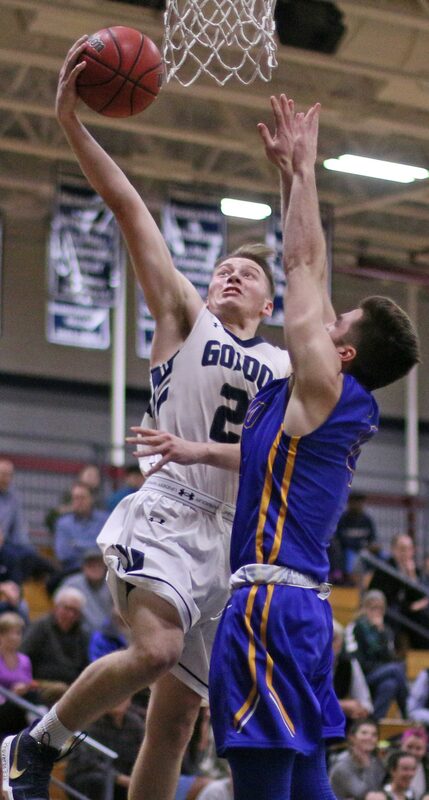 Parker Omslaer had one of his best games for Gordon. The 6-11 sophomore registered his third double/double (16 points/11 rebounds) and had a career-high six blocks. The returned students should be in the house on Tuesday night. The Scots could use the energy boost that a good partisan crowd can bring. The team is well worth the look. 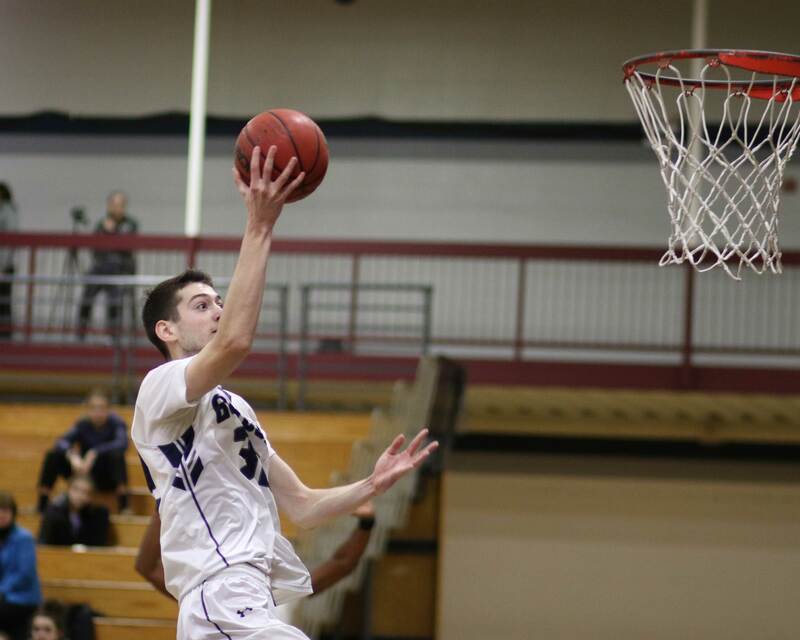 Eric Demers had a season-high 32 points including 21 in the second half. (Amesbury MA) March 1, 2014. I was out in Dudley (MA) that afternoon when Gordon stunned Nichols to win the Commonwealth Coast Conference tournament. After that? Eight straight losses to the Bison. 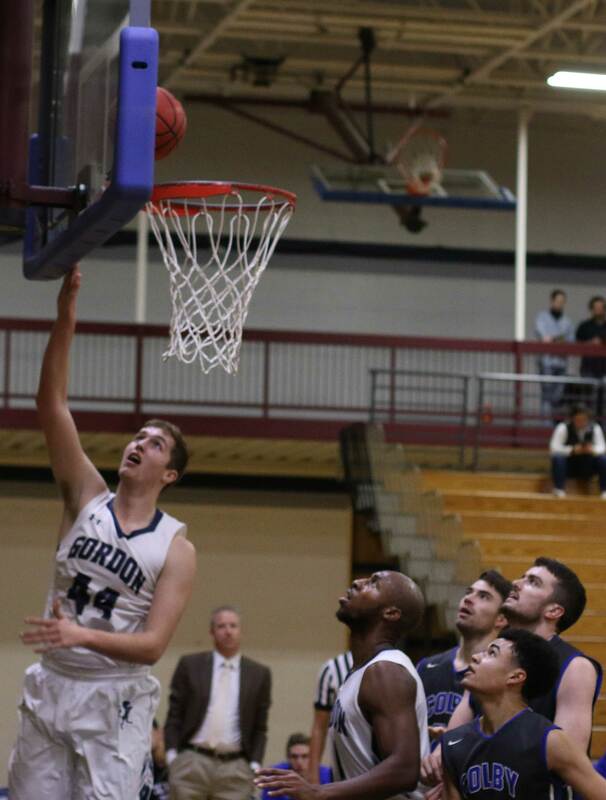 But this year’s Scots (13-1) put an end to all that with a 76-72 W this afternoon. Nichols (11-2) has won the regular-season CCC title the last five seasons. Their league record during that time? 80-10! The Scots were not in the “10” side of it, in fact, some of their most lopsided losses have been to NC. Today’s result, however, temporarily erased those bad memories and put Gordon all by its lonesome atop the CCC standings with a 5-0 record. Hold the celebration plans! There’s a ton of season left starting with the neighbors (Endicott) at the Bennett Center on Thursday night. How did Gordon defeat Nichols? Give their zone defense some credit. It changed the offensive dynamics for the home team. The Bison love to get to the basket or make three’s and they have the speed and shooters to do it. But this afternoon the zone took away most of the NC uncontested layups. That left the long-distance approach for the Bison and today they missed 24-of-31 triple tries. I saw UNE beat Nichols last year at Biddeford. In that one, Nichols tried to force their style on the non-stop Nor’Easters and couldn’t do it. Today there was 2-point gold available for them between 3-point range and layups, but the Bison turned down 2-point jump shots inside the foul line most of the game. Stubborn and it cost them. Give Eric Demers a ton of credit for the big win. No sooner had I raved about his “best I’ve ever seen” half against UNE on Thursday, when he tops it two days later! Eric’s second-half line was this: 21 points, 4 assists, 4 rebounds, and 5-of-6 free throws in the last minute. Eric (32 points) gave Gordon the lead, 69-67, using a screen to get the go-ahead jump shot. During Nichols next four possessions they tried to force layups twice where plenty of GC defense was already in place. They also launched two unsuccessful three’s. No interest in the short jumpers in the lane. Meanwhile, Eric attempted a three, got fouled and nailed all three attempts. 72-67. Another NC miss and another Parker Omslaer rebound. He had a career game in that category with sixteen of them. Parker made one free throw with 28 seconds left. 73-67. 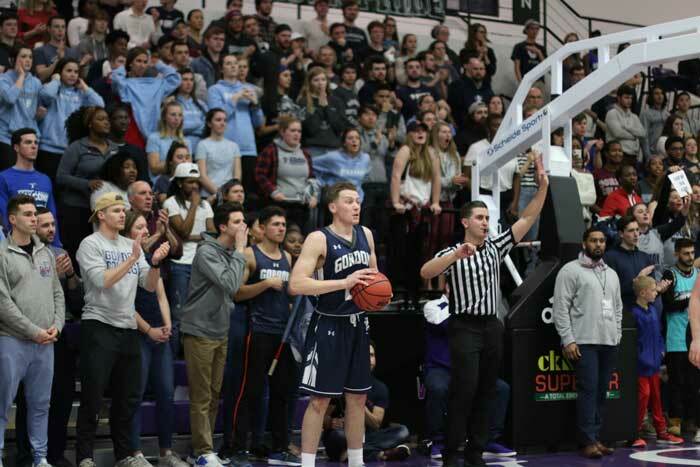 The Scots had the margin they needed to go on to a 76-72 win. Garrisson Duvivier finished with another double/double and believe me there was nothing easy around the basket. But that didn’t deter GD from attempting shots and drawing fouls. Garrisson had a lot to do with getting NC’s best big man (Jerome Cunningham) out of the game early on fouls with 3:46 left. 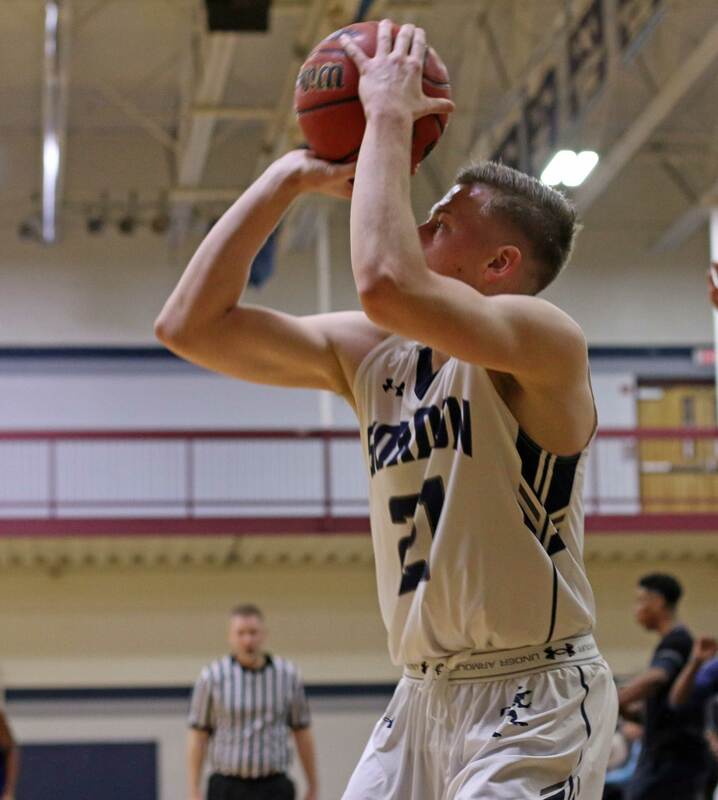 Jake Haar regained his scoring touch (14 points on 5-for-10 shooting) after going a combined 2-12 against ENC and UNE. The Scots have been good at getting Jake open looks out of set plays. Senior Marcos Echevarria had a quiet (for him) twelve points. 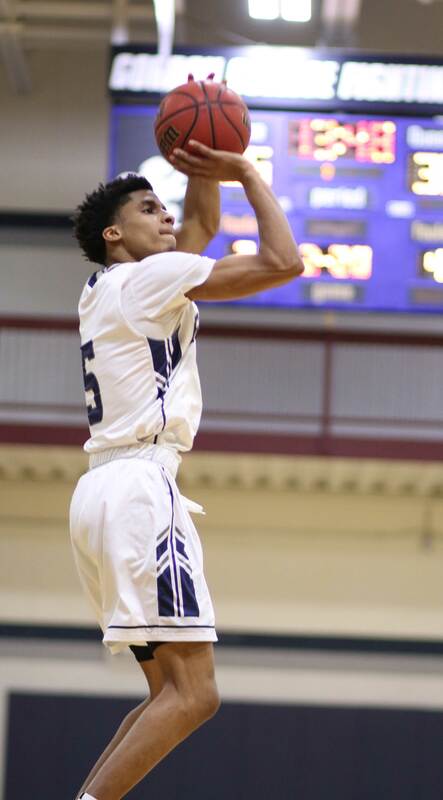 Marcos recently became Nichols all-time leading scorer. Today Marcos was slowed down a bit by a thigh injury. Garrisson (1628) moved past Woody Anderson (1622) today into 3rd place on Gordon’s all-time list. Today’s pleasant surprise extends the Gordon win streak to twelve. Nichols has had five seasons in a row with 20+ wins. During the last 5+ years they are 128-29! Beating them today was something special. I enjoyed the win but those twelve missed free throws were unnerving. Practice, practice, practice. 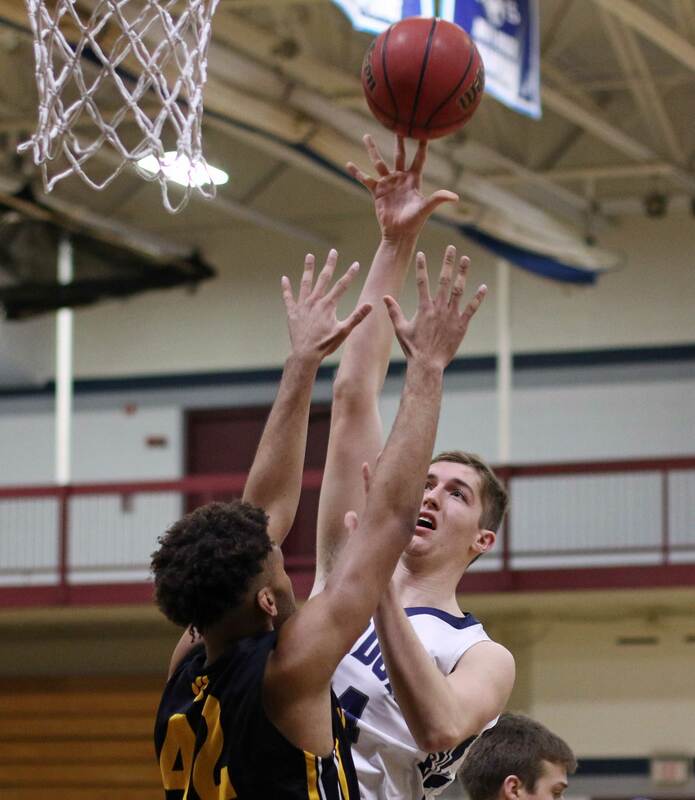 (Amesbury MA) Reach for the record books when UNE is the opponent. 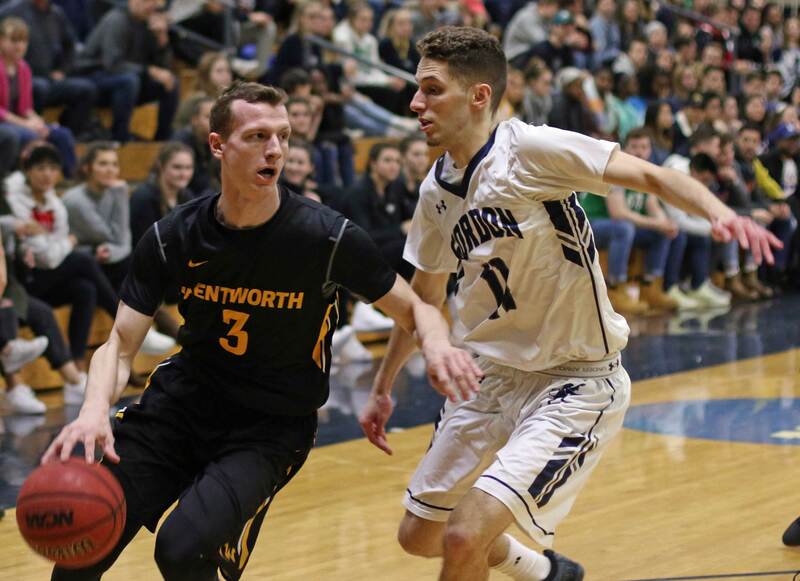 The Nor’easters play most of their defense in the backcourt, shoot three’s with abandon, and look to wear down opponents with frequent substitutions. 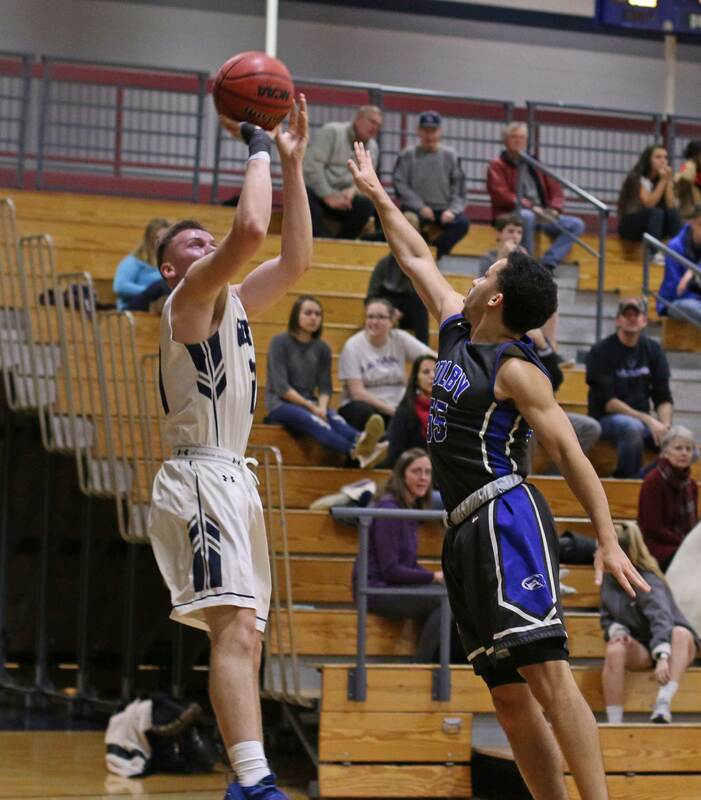 The style can throw an opponent off but not the Scots tonight as they started fast and routed UNE, 110-90, on Thursday night in Biddeford (ME). 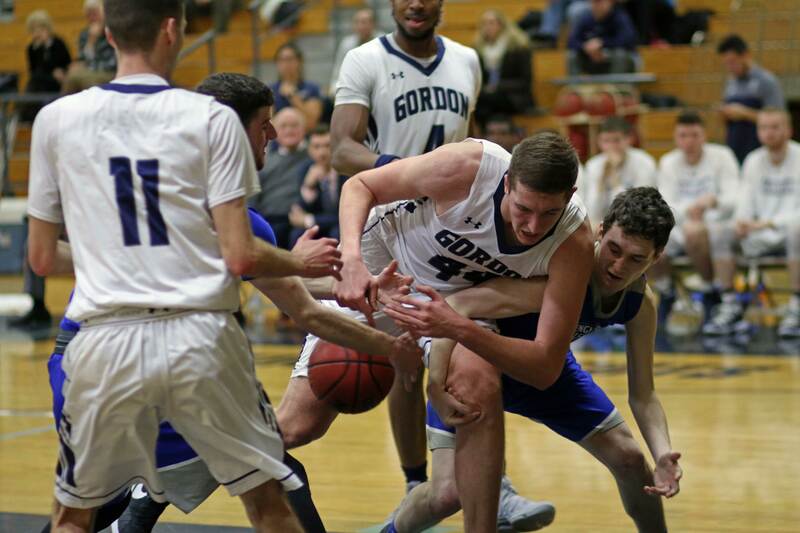 Gordon (12-1) went up by double figures five minutes into the game and put together an astounding 67-point first half while UNE committed seventeen first-half turnovers. If Eric Demers has had a better half, I can’t recall it: Twenty points, three assists, six steals! 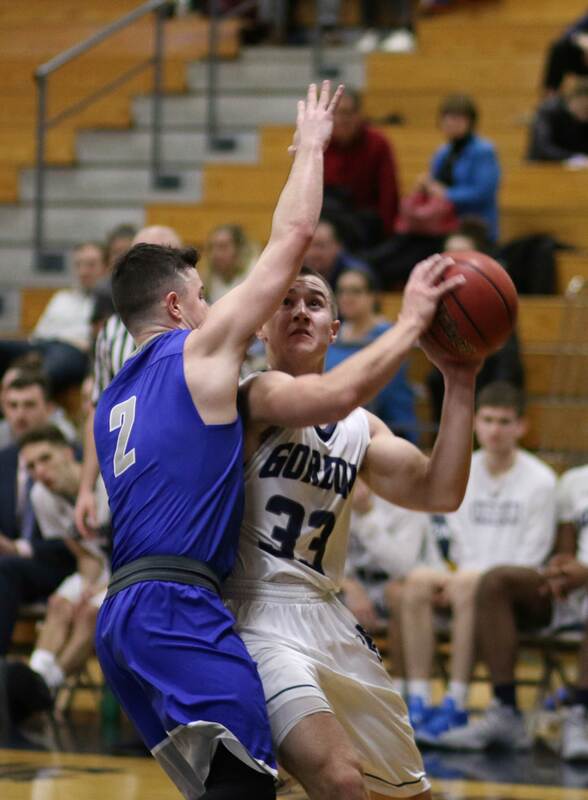 The Nor’easters were better in the second half but a 24-point deficit (67-43) is large when GC had so many good looks to choose from when they took care of the basketball. 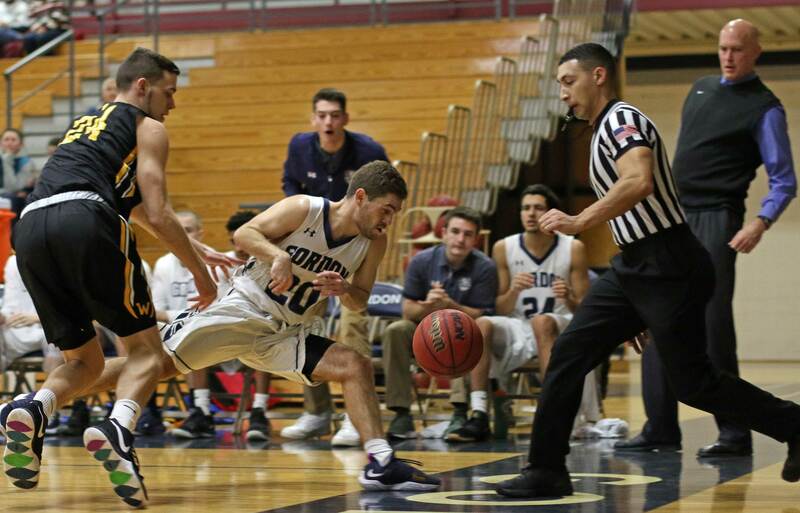 When the Scots forced UNE to play half-court defense there was gold to be found and it was usually close to the basket. 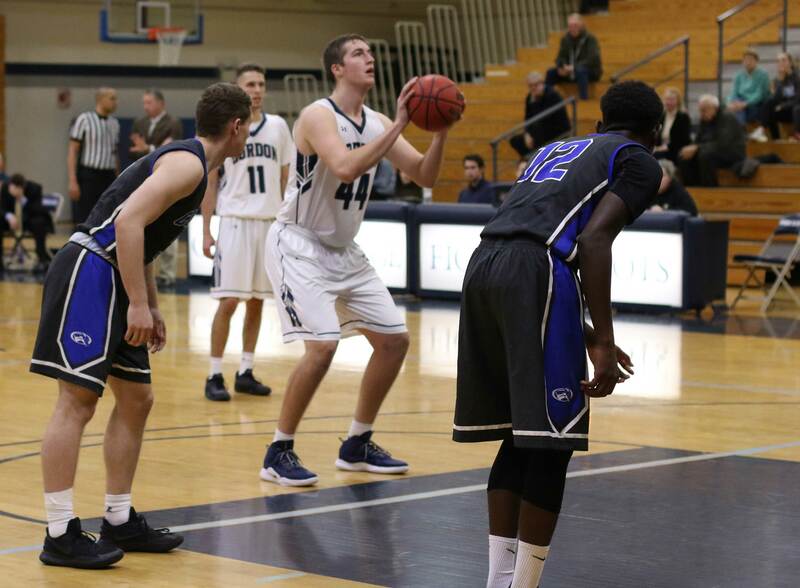 Sophomore Parker Omslaer (20 points) had a career game inside not missing a shot. Noah Szilagyi (24) and Josh Crutchfield (13) set career marks in points scored. Three of Josh’s points came on a half-court buzzer beater ending the first half. 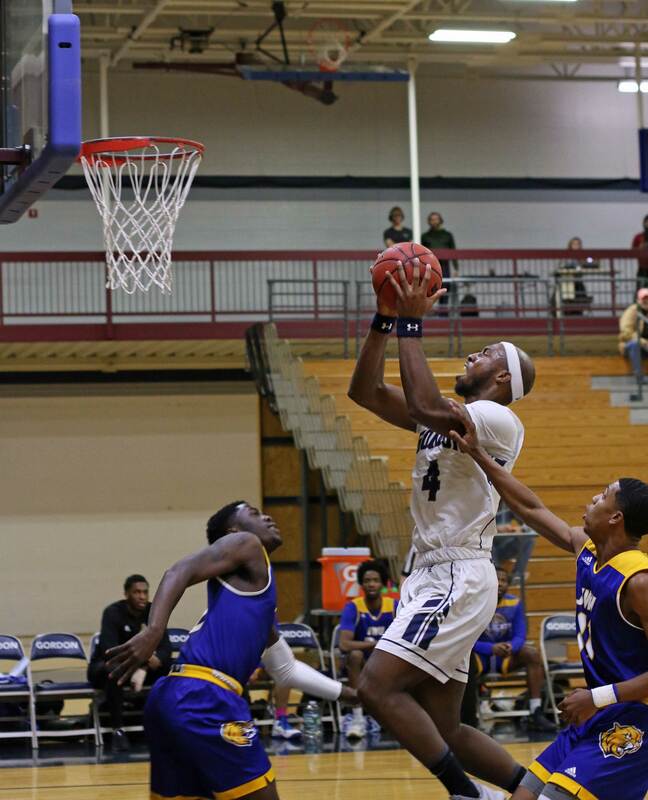 Garrisson Duvivier (17 rebounds/17 points) had his tenth double/double of the season. His nine assists were a career high. 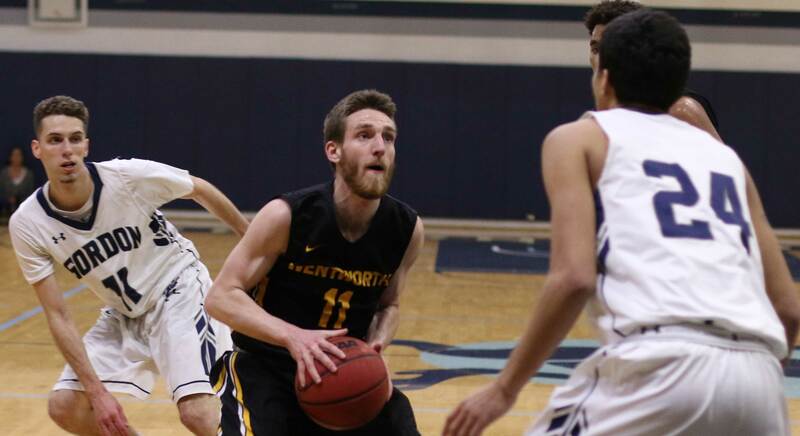 Eric Demers had the awesome first half and ended with 25 points, 7 assists, and 7 steals. The steals were a career high. With tonight’s points Eric passed Gene Fitzgerald and Nathan Ubelhofer on the all-time scoring list. ED is now 10th and climbing. The first half was a treat to watch. The second half, not so much. How come? The Gordon zone gave up too many three’s and layups. In the first half UNE struggled to get those kinds of shots. Not in the second half. On offense? Way too many turnovers. Twenty-five is a season high. Hanging onto the ball too long led to many of them. Trying to dribble through double-teams probably accounted for the rest of them. However, when Gordon found the open man, and passed the ball around, UNE was in trouble. 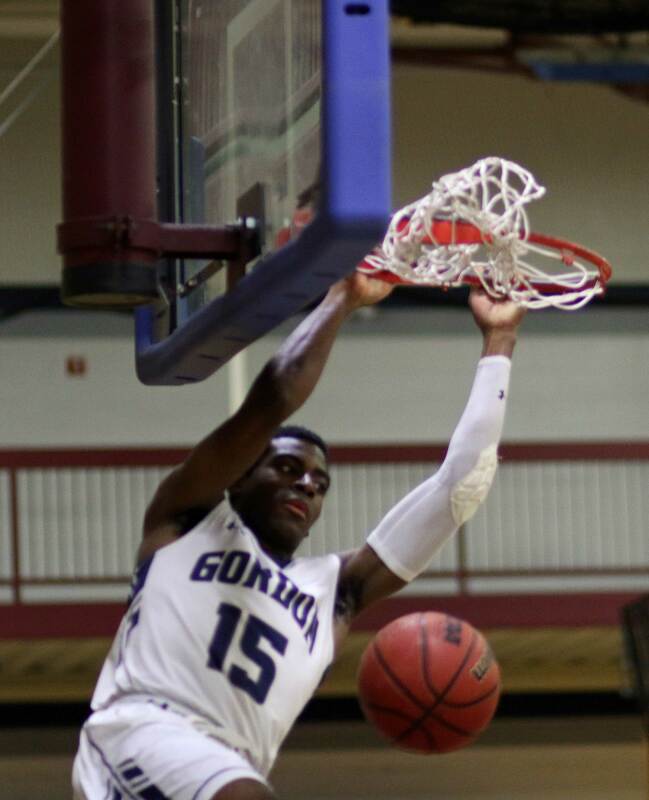 On one beautiful sequence every Gordon player touched the ball with a dunk finishing the possession. 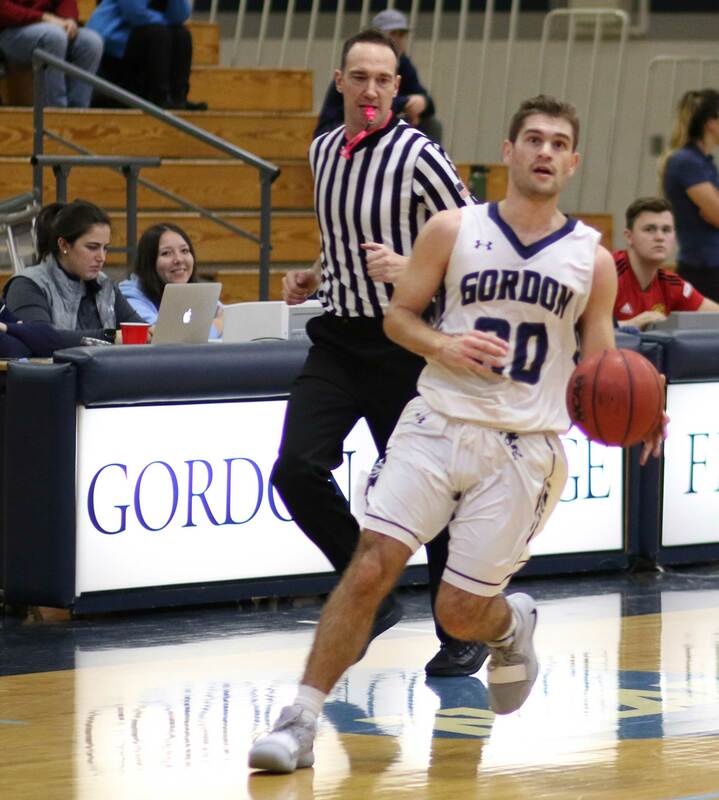 Gordon has now won eleven straight, but that mark won’t mean much to Gordon’s next two opponents; Nichols (Saturday) and Endicott (Thursday). If we’re still talking about Gordon’s win streak a week from now, it will be time to really get excited about this year’s team. (Amesbury MA) Another game, another surge of points that were significant in the outcome. 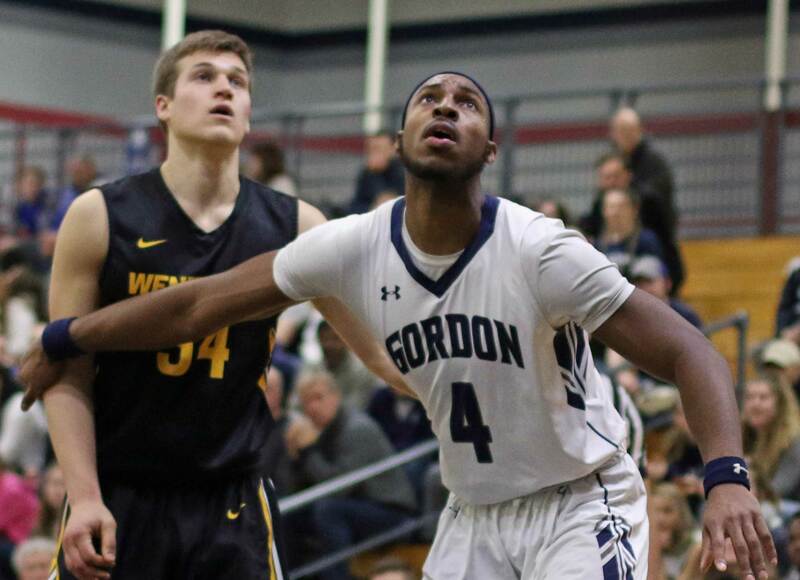 Gordon dropped non-league Framingham State, 86-70, on Friday night at Framingham. The Scots (10-1) remarkable run continues as this makes nine straight for the team from Wenham. 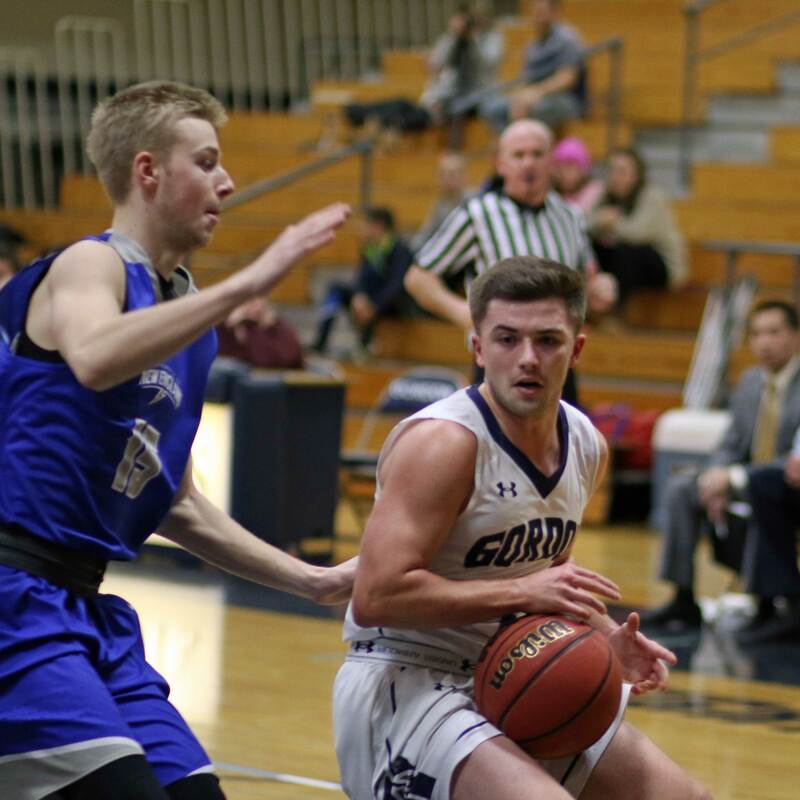 In this one GC put eleven unanswered points together scoring on four straight possessions in the second half between 12:24 and 10:38. That run of eleven turned a one-possession 52-49 lead into a many-possession 63-49 spread. The Rams (1-9) managed to hang around but a mini-run of six points between 4:41 and 3:27 did them in as the lead stretched to 77-60. Eric Demers, AJ Terry, and Avelino Damoura were the sparks during the collection of eleven. Eric nailed consecutive three’s to start it. The first was after AJ grabbed an offensive rebound and the second was assisted by AJ. Then AJ hit his own three assisted by Avelino. Avelino finished the run with a layup. 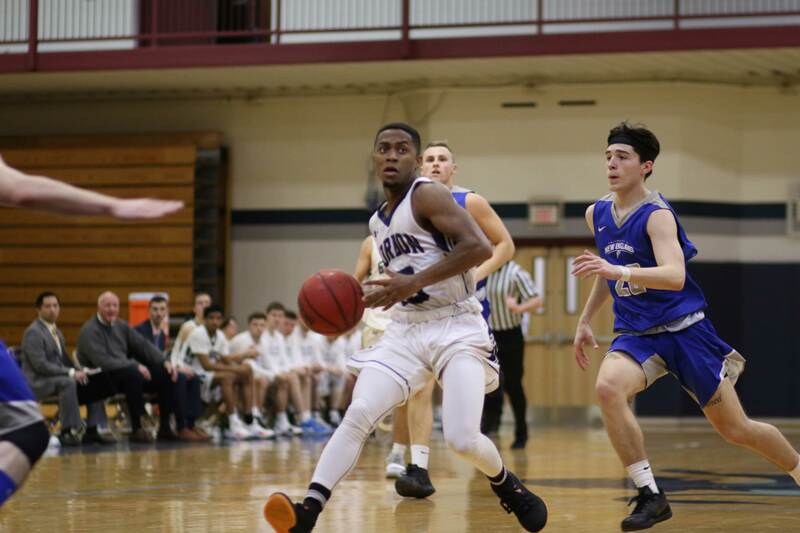 The six-point run that sealed any Framingham rally plans featured a Josh Ribeiro layup and two free throws plus a layup by Garrisson Duvivier. The variety of contributors is a good thing. The team does not lack scorers. 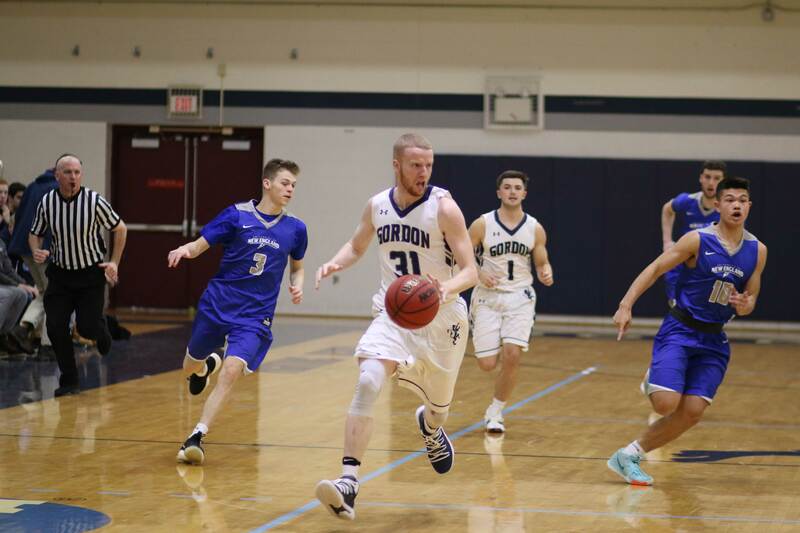 The Gordon zone did return after being exiled after a dismal first half against Eastern Nazarene. Unlike ENC, the Rams looked uncomfortable against the zone in the half-court offense. Where they did look comfortable was during high-speed transitions. Too often missed GC shots turned into drives and fouls down the other end. And there I go whining after the team has just won its 9th straight! 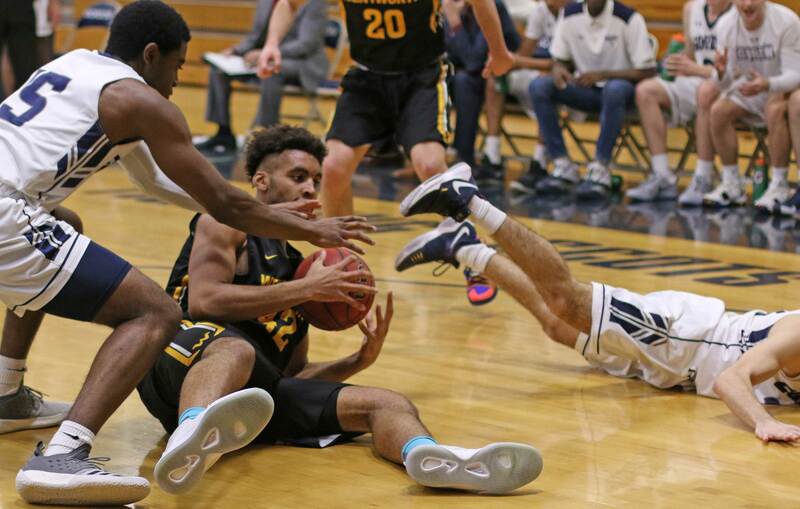 The Scots took advantage of their size-edge down low and owned the boards all night. Garrisson Duvivier finished with his ninth double/double (20 points/14 rebounds) of the season. Eric Demers had a quiet first half (five points) but registered thirteen points in the second half. Tonight featured his outside game. 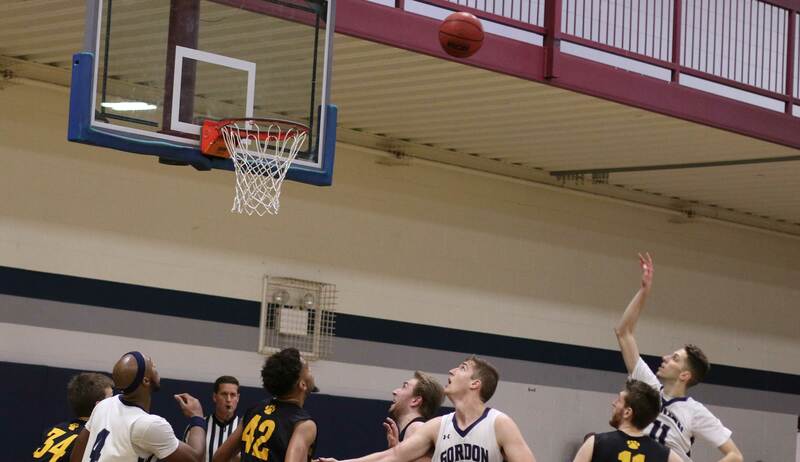 Jake Haar added twelve points while Parker Omslaer put in ten with eight rebounds and three blocks. 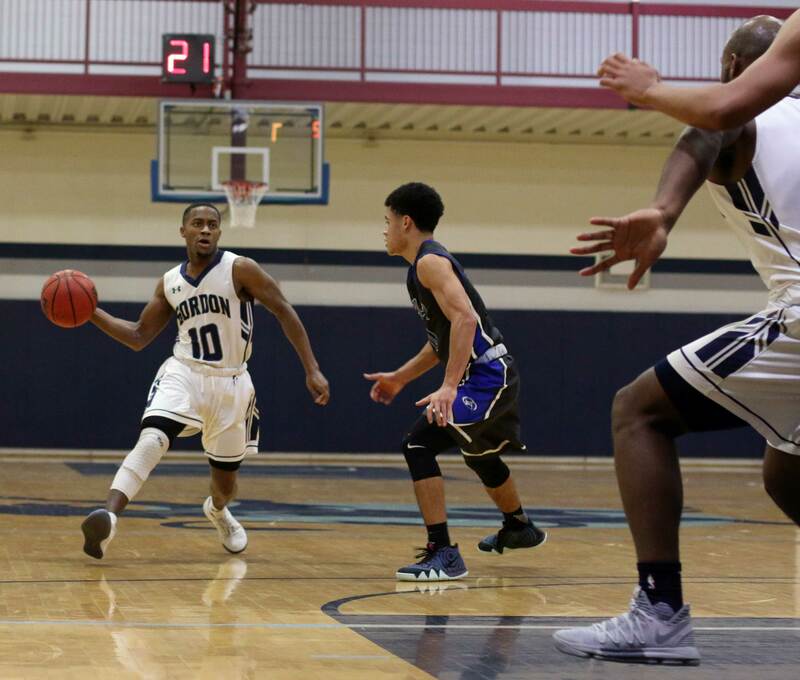 FSU’s Manny Payton (17 points) had the speed and the green light to keep GC defenders busy. 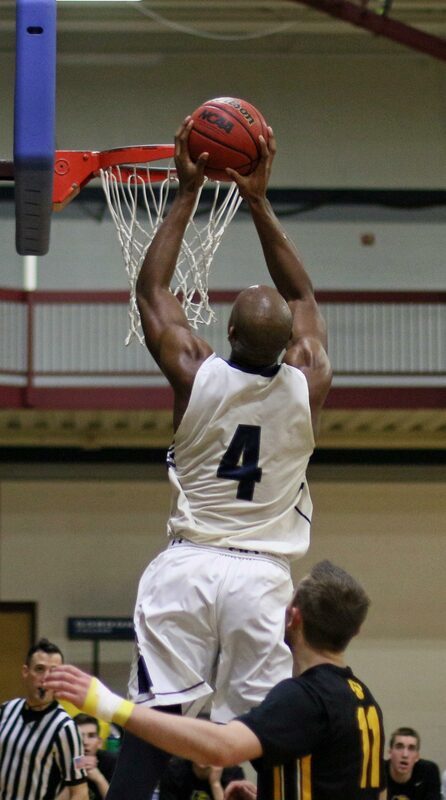 The senior had 32 points last game vs Tufts. The Rams are now 0-6 at home. They had a 6-20 record last season. 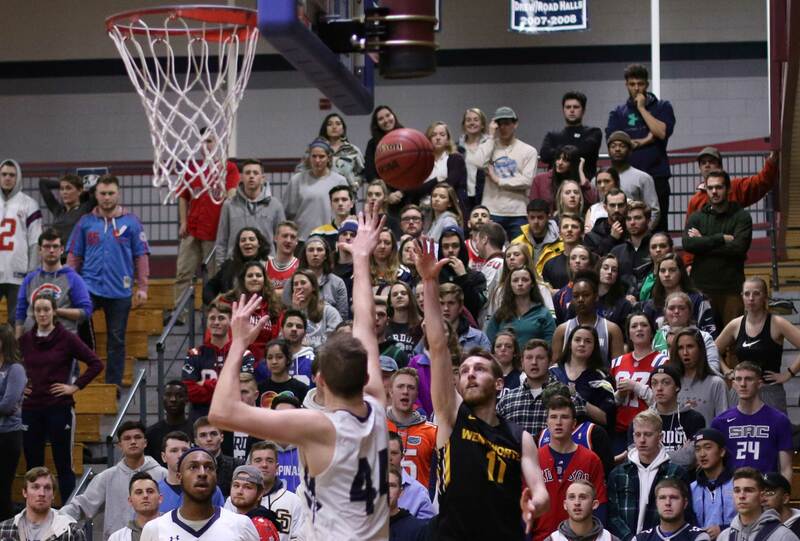 The Scots have exams and a vacation before returning for a rematch with Eastern Nazarene on New Year’s Eve afternoon (1PM). Many in attendance will be dressed up as empty seats! 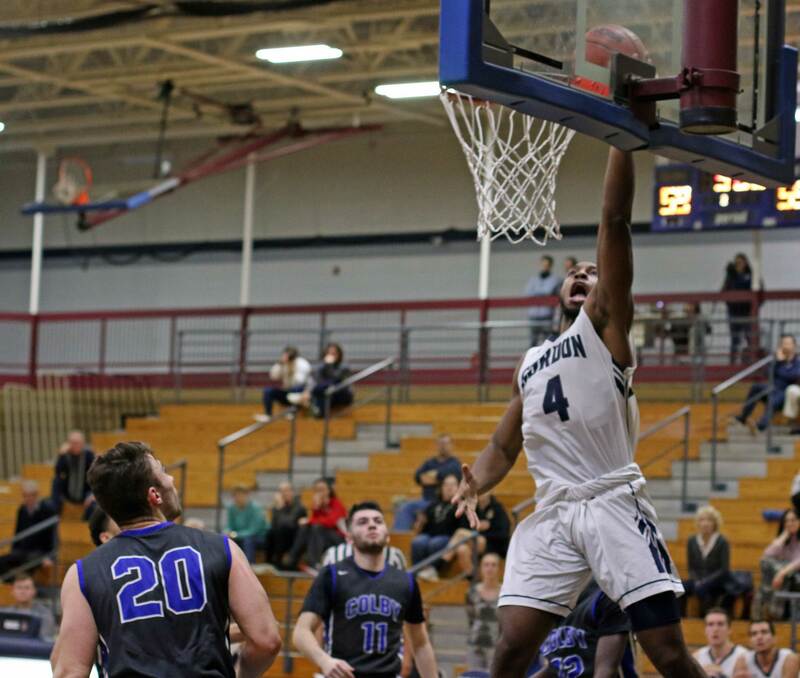 David Massillon was injured against Framingham State and saw short minutes. One way to attack a zone has always been to fast break and not let it get set up. I saw some of that happening tonight. Christmas thought: Jesus came down to earth because we can’t get up to Him. What a Savior!